Diabetes is one of the leading causes of amputation in New Zealand but a team of Wellington clinicians say in many cases it’s entirely preventable. In an effort to prove their point the team, led by vascular surgeon Kes Wicks, has set up a first-of-its-kind free clinic for diabetics with a high risk of foot disease. Wicks, with the support of Capital & Coast DHB (CCDHB), started the High-Risk Diabetes Foot Clinic last year to focus in on the preservation of limbs, bringing together several experts in the field. 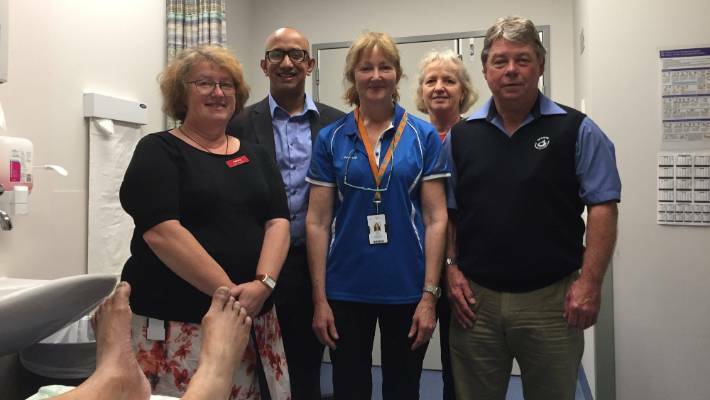 Wellington’s recently established high-risk diabetes foot clinic, staffed by a multidisciplinary team, is improving the lives of hundreds of people with diabetes and helping reduce the number of lower limb amputations. The clinic, a first for the Wellington region, operates fortnightly with a multidisciplinary team of a podiatrist, orthotist, vascular surgeon, diabetic nurse specialist or endocrinologist, infectious disease doctor and orthopaedics. Wicks said the main catalyst for getting the clinic across the line was a decision by CCDHB to bring in an in-house podiatrist, Fiona Popert, after 20 years of outsourcing. Wicks says people with diabetes are at a high risk due to nerve or blood vessel damage that results from high blood glucose which can lead to ulcers and breakdown of skin. While the scheme initially faced some push-back due to the clinic’s potential cost, Wicks said once it was found to be cost neutral to set up the DHB came around. “Foot infections for diabetics is a hugely costly process for the patient, for the community and for the health system. “From a patient perspective they were going to four clinics and seeing four specialists so this is much easier. In New Zealand it is estimated the number of people diagnosed with diabetes exceeds 200,000 – predominantly type 2; with at least 100,000 remaining undiagnosed. About 15 per cent of that population will develop foot ulcers in their lifetime which left untreated could result in amputation. Foot ulcers affect a person’s physical, emotional, and social wellbeing. As a result, Wicks said the issues could contribute to an economic loss creating a huge public health burden. Diabetic patients are prone to severe peripheral arterial disease in the blood vessels below the knee. That, along with several other factors, results in their high rate of amputation. Both Diabetes New Zealand and its Australian counterpart have set a goal to stop preventable amputation in 10 years, something Wicks said was achievable if best practice guidelines were followed. His clinic is based on the United Kingdom’s NHS NICE (National Institute of Health and Clinical Excellence) system which advocates for a multidisciplinary approach.